Agapanthus africanus (L.) Hoffmanns.Including Agapanthus africanus subsp.walshii (Leighton.) Zonn. & Duncan comb. Nov.
Agapanthus are one of South Africa's best known garden plants and are grown in most countries in the world. Their strap-like leaves and striking blue or white flowers make them favourites in plant borders as well as in containers. 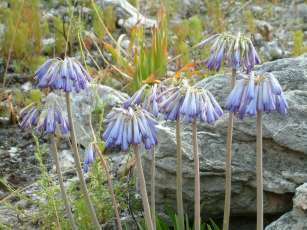 They are all easy to grow except for Agapanthus africanus and A. walshii which a recent publication (Zonneveld & Duncan 2003) has proposed is a subspecies of A. africanus. 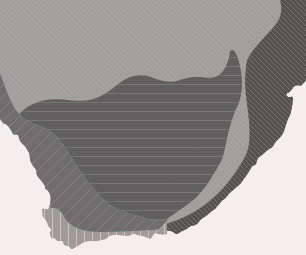 The perianth segments of A. africanus subsp. africanus are thick in texture and the flowers are open faced and range in colour from light to mainly deep blue. Rare sightings of white flowered plants have been recorded. Fires stimulate profuse flowering. 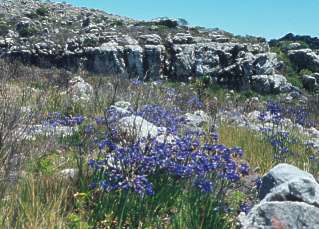 After a recent fire in the Silver Mine Nature Reserve on the Cape Peninsula a single white flowered plant was noted amongst thousands of blue flowered ones. The plants flower mainly from December to February. The leaves are evergreen and strap like, about 15 mm wide with an average length of 350 mm. The flower stalk is usually under 700 mm tall. This subspecies is quite common and because of the fairly inaccessible terrain its survival is assured. Agapanthus africanus subsp. walshii (Leighton) Zonn and Duncan comb.nov. In a recent publication, Agapanthus walshii has been renamed as a subspecies of Agapanthus africanus. The authors, using nuclear DNA content (2C) and pollen vitality and colour are proposing that the ten species recognised by F.M. Leighton in her 1965 Agapanthus revision be reduced to six species and the name change Agapanthus africanus subsp. walshii has been published. This reclassification needs further study into the morphological characteristics of the plants to be fully supported. The flowers are pendulous, often light blue, seldom dark blue and rarely white. The leaves are evergreen, mainly erect and on average 10 mm broad and 200 mm long. The flower stalk is 600 mm tall. It also flowers best after a fire. Pollination is by wind, bees and sunbirds. Baboons and buck sometimes eat the flower heads just as the first flowers begin to open. The seed which is often parasitized is dispersed by the wind. These plants are adapted to survive fire in the fynbos. They resprout from thick, fleshy roots. 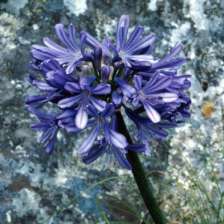 Both subspecies of Agapanthus africanus are difficult to grow. A africanus subspecies africanus is not suitable as a garden plant except in rockeries. They are best grown in containers in a well drained, slightly acid sandy mix and appear happiest if pot bound. They seem to grow best in shallow containers and will flower regularly if fed with a slow release fertiliser. A. africanus subsp. walshii is by far the most difficult agapanthus to grow. The best medium appears to be a very well-drained, sandy, acid mix with minimal watering in summer. It can only be grown as a container plant and will not survive if planted out. It is unfortunate that it is so hard to grow because it is most attractive when in flower and would make an excellent pot plant. Both subspecies can be propagated by fresh seed. The seed germinates best if sown in a well-drained seed mix and lightly covered. The seed trays should be placed on heated beds under a mistspray set for about five minutes twice a day. Germination takes place in 4 to 6 weeks and the trays should then be removed to a lightly shaded area. Good results will also be obtained when the trays are placed indoors or outdoors in light shade and watered twice a day, provided the day time temperature is higher than 18° Celsius. Duncan, G. 2002. Grow Agapanthus. Kirstenbosch Gardening Series, National Botanical Institute, Cape Town. Zonneveld, B.J.M. and Duncan, G.D. 2003. Taxonomic implications of genome size and pollen colour and vitality for species of Agapanthus L'Heritier (Agapanthaceae). Plant Syst. Evol. 241: 115-123 (2003).